There are approximately 4,740 species of frogs around the entire world. Unfortunately, about 120 amphibian species, including frogs, toads and salamanders, have disappeared since 1980. Historically, one species of amphibian would disappear every 250 years. Frogs can make lovely pets, but frogs in the wild are facing population declines and extinction largely as a result of human activities. Unfortunately, the pet trade is likely contributing to the amphibian extinction crisis and the spread of an devastating infection by Chytrid fungus .For this reason, you should only buy frogs that you are sure are captive bred locally and tested to be free of disease. It may be impossible to find frogs which meet these conditions, but otherwise, pet frogs may be contributing to the decline of wild frog populations. Frogs in captivity are quite long lived (with proper care), so be prepared for a long term commitment. Average life spans are typically 4-15 years, although some have been known to live longer. Keeping frogs' enclosures clean can be a lot of work. Many frogs have fairly simple light, temperature, and humidity requirements, but they are very sensitive to contaminants and waste in their environment. Some people find frogs boring, though some of the smaller frogs are quite active. However, many of the larger frogs are quite sedentary and don't move around much. You need to handle insects to feed most frogs. Some of the larger frogs will even eat pinky mice. It can be difficult to find someone to care for your frogs if you plan on travelling at all (keeping in mind you could have your frog for years, you may eventually need someone to look after your frogs for a significant length of time). Grown size of frogs. Some of the smallest frogs you might see in a pet store grow into giants. Sometimes their name adds to the confused expectations -- "pixie" frogs, which sound like they should be small, are actually African bullfrogs which grow to be 8-9 inches long and very fat. They get their cute name from their latin name, Pyxicephalus adspersus. The kind of tank they will need - aquatic, terrestrial, arboreal, or semi-aquatic (or half land and half water, which is probably the trickiest to set up and one of the most common types of tank needed for frogs). Does the frog need to hibernate? Dwarf Frogs: small, active and completely aquatic, and are among the easiest of frogs to keep in captivity. Oriental Fire Bellied Toads: semi-terrestrial frogs that are fairly active and relatively easy to keep as pets. White's Tree Frog: terrestrial (tree frogs) that are docile and easy to keep, but they do tend to be fairly inactive. African Clawed Frogs: aquatic frogs that get quite large (be careful not to confuse young African clawed frogs with the much smaller dwarf clawed frogs). Care is not that difficult, though. 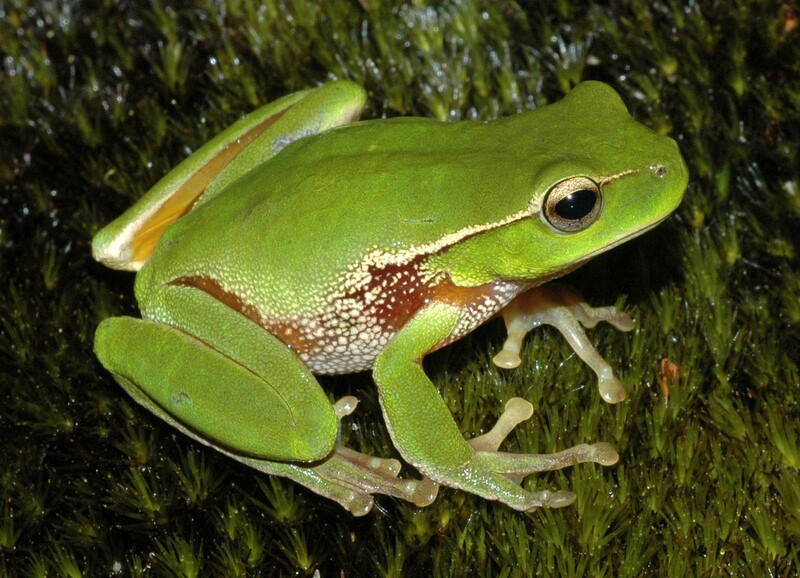 American Green Tree Frogs: another good tree frog suitable for beginners. Pacman Frogs: mostly terrestrial frogs are pretty easy to care for, but get quite large and are quite sedentary. United States of America -There are about 90 species of frogs in the United States.